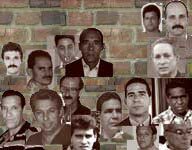 Deisy Talavera López, a resident of Cárdenas, was arrested Jan. 31, after she posted on the door to her home, a poster expressing support for Cuban political prisoners. A week later, she was transferred to a women's prison in Matanzas, where she is awaiting sentencing on a charge of "assault," according to a report from human rights activist Leticia Ramos Herrería. Verónica López León told Ramos that police would not allow her to see her daughter before she was transferred, to hide the fact that officers had beaten Talavera. For her part, Talavera wrote in a note to her mother that she is resolute and that she would not disappoint other political prisoners on the island. UPDATED, April 30, 2008 Talavera López was sentenced April 16 to 2 years in prison, after being convicted of the supposed crimes of "attacking" and "disrespect." UPDATED, March 3, 2010 Talavera was released from prison on Feb. 26, 2010.